espite the demanding nature of the job, many nurses put on maternity scrubs and keep working while pregnant, sometimes even up to the moment their water breaks. However, just because many nurses work while pregnant, that doesn’t mean it’s without challenges and concerns. We’ve rounded up 22 tips across five categories — scheduling and work hours, communication, clothing and shoes, food and drink, and health — to help you and your baby have the safest, easiest pregnancy possible even as you continue working as a nurse. Look into working 8s instead of 12s. If their workplace allows for it, some nurses try to adjust their schedule so they work shorter shifts more frequently instead of being on their feet for 12 hours straight. While some nurses love all the standing and walking and say it helps the baby drop, others find that 12-hour shifts leave them completely exhausted and sometimes in pain. If you’re struggling with 12-hour shifts, see if any 8-hour shifts are available instead. Try to spread out your shifts. Even if you can’t work shorter shifts, spreading out your three 12s so they’re not back-to-back can also help a lot. 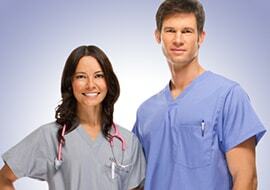 Many expecting nurses find that three consecutive 12-hour shifts utterly exhaust them. Spacing out those three shifts so you get at least a day of rest in between can go a long way towards keeping your energy up as your pregnancy progresses. Weigh the day vs. night shift decision. Some nurses like to keep day shifts while they’re pregnant because they have trouble working during the night and sleeping during the day. Other nurses are total night owls and actually prefer working the night shift, even while expecting. There’s no right or wrong answer to this, but if you can, pick the shift schedule that aligns best with your natural sleeping patterns so you’ll be able to truly rest when you’re off duty. See if light duty is an option. While not all hospitals have the option, sometimes nurses try to go on light duty — doing management tasks and chart audits, rather than lifting heavy patients and other strenuous work — later in their pregnancy. Even if your hospital doesn’t offer official light duty roles, sometimes coworkers are able to help pitch in with lifting patients and other strenuous tasks. Again, this completely depends on the facility, so if your doctor has ordered you to go on light duty, check with your HR department about accommodations. Go part-time or start your leave early. If their facility can’t accommodate shorter shifts or light duty, some nurses either cut down to part-time schedules, start their maternity leave early or use vacation time. Of course, part-time work means less money and may affect your insurance and benefits, and the other two options may reduce the time you have with your baby after the birth. But if your employer can’t or won’t work with you, cutting down on your hours or taking off early can be worth it to avoid complications and ensure you have enough energy for the birth. You’ll need to let your superiors know that you’re expecting — and you might need to have that conversation sooner than you would at another job, given the demanding work nurses are expected to do. If you think you might have to change your schedule or take leave before the due date, you should talk about it with your boss early on. Similarly, you’ll also need to notify your coworkers that you’re expecting. 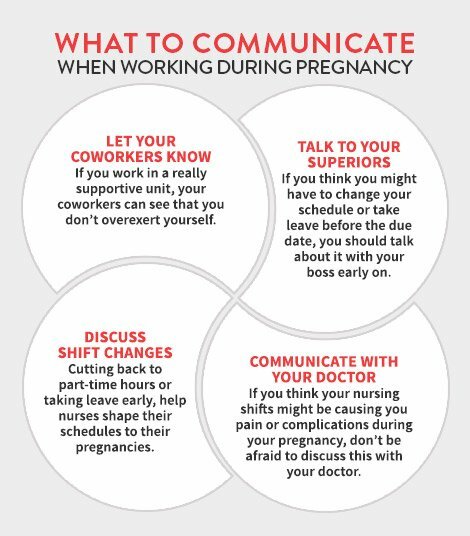 If you work in a really supportive unit, your coworkers can actually be a big help during your pregnancy, seeing that you don’t have to lift a heavy patient alone and otherwise making sure that you don’t overexert yourself. 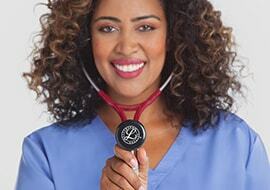 Stay in constant communication with your doctor. 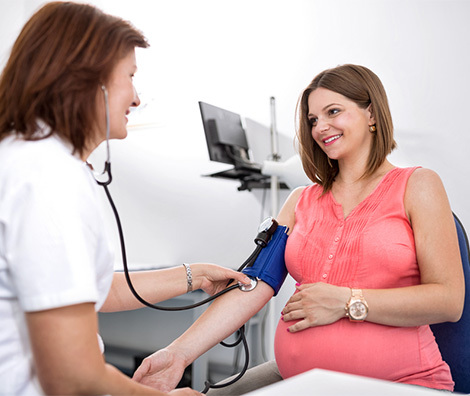 Ideally, your doctor is your advocate and partner throughout your pregnancy — so if you think your nursing shifts might be causing you pain or complications during your pregnancy, don’t be afraid to discuss this with your doctor. Similarly, if your doctor recommends light duty, early leave or other work restrictions, communicate this to your boss and coworkers. Discuss shift changes with your partner. Whether it’s switching from a night shift to a day shift, cutting back to part-time hours or taking leave early, nurses utilize several different methods to shape their schedules to their pregnancies. However, these decisions can affect your overall household income or the days of leave that you have left after the birth. Make sure you bring your partner into the discussion so you can plan for the changes together and come up with a strategy. A good pair of shoes can help stave off foot, leg and back pain during pregnancy as you stand and walk for 12 hours straight. 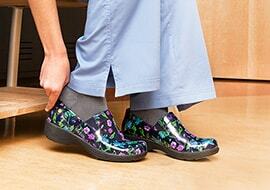 Look for tennis shoes or nursing clogs that offer good arch support and a well-cushioned design, as well as slip-resistant soles to prevent falls. Also look for shoes that use moisture-wicking fabrics or that otherwise vent sweat and heat so your feet will stay cool and dry. 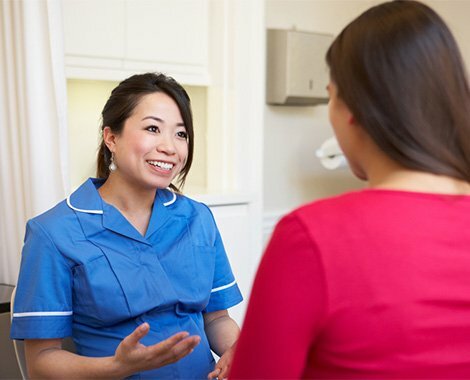 Pregnant women wear compression socks even if they’re not nurses, and nurses wear compression socks even when they’re not expecting — so if you’re a pregnant nurse, you definitely need to be wearing compression socks, which encourage good circulation, reduce swelling and help fight foot and leg pain. There are a wide variety of compression socks available, and you can even look into maternity compression stockings if your thighs are also swelling. Chances are that you’ll already be uncomfortable enough during pregnancy, so you don’t need scratchy, ill-fitting scrubs compounding to the situation. Look for moisture-wicking fabrics in comfortable cuts. Once you start showing, you’ll need to invest in a couple pairs of maternity scrubs to accommodate your growing little one. You know you should stay well hydrated even when you’re not expecting, and drinking enough water only becomes more critical during pregnancy. After all, hydration can help fend off constipation, hemorrhoids, excessive swelling, urinary tract or bladder infections and premature or early labor. The Office of Women’s Health recommends aiming for at least 10 cups of fluids daily, and your urine should be colorless or pale yellow if you’re staying adequately hydrated. Use the bathroom whenever you can. Speaking of urine, it’s a truth universally acknowledged that pregnant women need to use the restroom quite frequently. Unfortunately, as a nurse you do have some restrictions on when you can use the bathroom: You can’t just stop in the middle of treating a patient to take care of your own needs. This makes it doubly important to take advantage of any breaks that you do have and to use the restroom whenever you can. Pack your own meals and snacks. Whenever possible, pack your own meals and snacks and bring them with you to work. This will ensure that you are getting all the nutrients you and your baby need and that you’ll always have something on hand to satisfying any cravings. Plus, if you don’t have time to make it down to the cafeteria on your shift, you’ll still be able to eat something. Add an anti-nausea pack to your nursing bag. You can store your food in your nursing bag — but with food can come nausea, so you should keep an anti-nausea pack right next to those tasty, nutritious snacks. Make sure you have Zofran, bland crackers and whatever else helps you manage should the urge to vomit strike while you’re on shift (which it almost certainly will). When it comes to deciding how long to work, you’ll need to take into account your past health issues and past pregnancies, if you’ve had any. If you have certain conditions, such as preeclampsia, a history of miscarriage, diabetes, or autoimmune disease (just to name a few), your doctor might recommend light duty or taking off work a few weeks early so you can rest up for labor. Watch out for potential dangers. Nurses work with ill patients who may be physically and mentally unstable as well, which can put nurses in compromised positions even if they’re not pregnant. When you’re carrying a baby, you need to be extra vigilant of a potentially harmful situation, such as treating a patient with a nasty case of contagious pneumonia or lifting an individual who tends to kick or lash out. If your facility has an infection control team, you can also talk to them for advice on keeping you and the baby safe from diseases during your pregnancy. Be cautious lifting heavy items. You’ve probably heard that you shouldn’t lift heavy objects while you’re pregnant, which includes patients. While it’s a common myth that lifting heavy objects causes miscarriages, it can hurt your back because the growing baby already puts a lot of strain on your muscles. Make sure to lift with your knees while keeping your back straight, and don’t hesitate to recruit help if you need it. Women at risk for premature labor might also need to stop lifting heavy objects after the first trimester; talk with your doctor if this applies to you. Know that your tolerance levels may change. Nurses are known for their strong stomachs and often deal with situations involving blood, vomit and other bodily fluids that would turn other people green. However, it’s no secret that nausea, vomiting and other unpleasant side effects are often par for the course during pregnancy, especially during the first trimester — and nurses are not immune from this. Indeed, some nurses find that their tolerance levels change drastically during pregnancy, and that they can’t complete formerly routine tasks without their stomachs heaving. Know your limits, and if certain tasks cause you to throw up without fail, try to limit or avoid those. Don’t compare yourself to others — or even to your past pregnancies. Every pregnancy is an individual experience, and whether this is your first child or your fifth, comparing yourself to others won’t help anyone. Some nurses live in their maternity scrubs and work right up until their water breaks, while others take off at 30 or even 20 weeks. 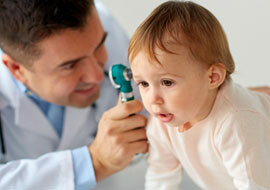 Only you and your doctor know what the right choice is for you, and this can vary from pregnancy to pregnancy. One pregnancy might be pain and complication-free and you can work right up until the end, while you might feel ill all the time on the second one and need to take off work weeks early.. Put yourself and your baby first. As a nurse, your job is to promote the health of your patients — and as a mom-to-be, your job is to protect the health of yourself and the baby. Sometimes these two responsibilities conflict, such as when a pregnant nurse feels pressured to keep working right to the end when she really needs a rest before the birth. Even though you might feel otherwise, you should always put your health and the baby’s first to ensure a safe birth for the both of you. Working as a nurse while pregnant certainly comes with its challenges, but many nurses do it every year and deliver healthy, happy babies. These tips can help you stay safe and comfortable while on the job, but if you do ever feel like your work as a nurse is compromising your health or the baby’s, talk with your doctor to come up with a solution.